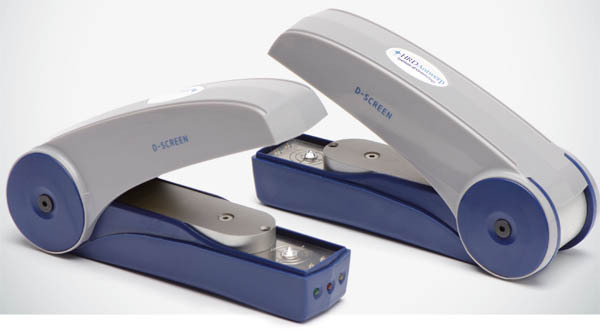 The D- Screen is a practical research device developed by HRD Antwerp. It distinguishes stones that are not lab grown and have not been HPHT colour enhanced from stones that are potentially lab grown or may have been colour improved by means of HPHT. Up until the sixties, a colourless or nearly colourless diamond was by definition a natural one. In the eighties the first lab grown diamonds of gem quality appeared on the market, using HPHT synthesis. (High Pressure High Temperature). Commercial HPHT treatment gained a great deal of attention, as the technique could turn some brown diamonds into colourless diamonds. It was after all, the very first technique that could “remove” colour. In the beginning of the 21st Century, CVD techniques were introduced to produce lab grown diamonds (Chemical Vapour Deposition). It also became possible to remove the brownish colour of some CVD lab grown diamonds in order obtain colourless diamonds by using HPHT treatment. The arrival of these new techniques brought about enormous challenges for scientist and researchers. They embarked upon an intensive search for new techniques to identify the true nature of a diamond: natural, treated or lab grown. These techniques were also to be user-friendly, reliable and economical. 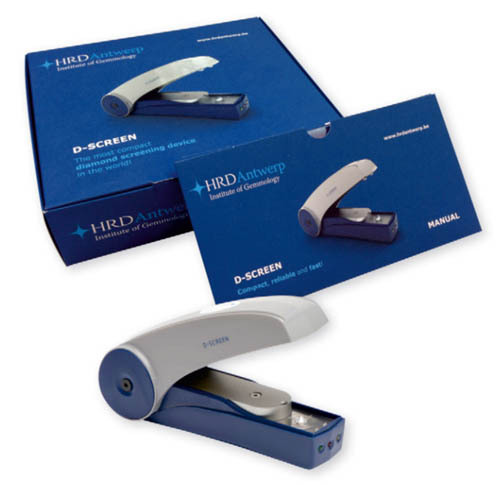 Years of research by HRD Antwerp resulted in the launch of a unique device: the D-Screen. COMPACT, RELIABLE AND FAST. Green: the diamond is not synthetic and not HPHT colour enhanced. Orange: the diamond may be lab grown or HPHT colour enhanced, the diamond requires further examination in the HRD Antwerp Diamond Lab. Red: low battery voltage or defective device. A D-Screen is not developed to distinguish simulants such as cubic zirconia (CZ) and moissanite. Non-destructive testing methods are used to distinguish diamond and its simulants based on different material properties. Amongst the testing methods used are optical inspection, gem testers, hardness pencils and/or density measurements.